I don't remember where this lasagna recipe originated, but it has been modified so much that it doesn't really resemble the original lasagna recipe anyway. I don't care for ricotta cheese in lasagna, and cottage cheese definitely does not belong in lasagna. This recipe doesn't have ricotta cheese in it, but instead uses mozzarella, cheddar, and Parmesan. I use Italian sausage, but no ground beef. 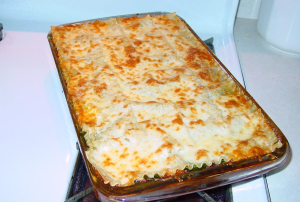 When I make this, I make a double recipe in a very large (9½ x 14½ x 2 inch) Pyrex cooking dish. I also like to have a few noodles that get a little crispy, so instead of topping it with the grated Parmesan on top of the meat sauce, I finish it with an extra layer of noodles, shredded cheese, then the grated Parmesan. Remove sheath from sausage. This may be easier if you scald the sausage first. After removing the sheath, cut or crumble the sausage into small chunks. In a large skillet, fry (sauté if you like) over medium high heat, the sausage, onion, and garlic until the sausage is lightly browned. If there seems to be excess grease in the pan, drain and discard the grease. If the sausage chunks seem too large, I put the cooked sausage into my food processor and pulse it once or twice, then return it to the pan. Stir in the tomato sauce, parsley, sugar, salt, basil, oregano, and pepper. Cover and simmer 20 minutes. Cook the lasagna noodles as directed on the package. Mix the two shredded cheeses together. Spread one cup of the meat sauce in the bottom of an un-greased oblong baking dish, 9 x 11 x 2 inches (or 9 x 13 x 2). Layer ½ each of the noodles, the remaining meat sauce, and the cheeses. Repeat. Sprinkle the top with the grated Parmesan cheese. Tent Aluminum foil over the pan and bake in a 350° F oven 30 minutes, then remove aluminum foil and bake until the top browns nicely, about another 15 minutes. Let stand 15 minutes to cool before cutting and serving. Serve this with a nice salad, and an Italian wine.